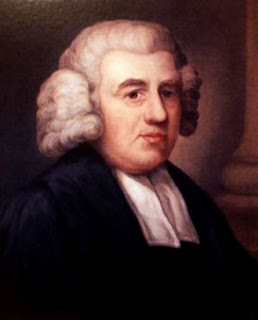 John Newton will forever be remembered as the former slave trader who, by God's amazing grace, was redeemed and set free from a life of sin and recklessness. Of course we know that he penned the beloved, classic hymn Amazing Grace as a testimony to the transforming power of the gospel of Jesus Christ. Newton felt called by God to encourage and admonish others through the written word, a man of letters whose scribblings have been preserved for centuries to benefit us today. Recently I was perusing some of Newton's letters and found one that was especially meaningful to me as I navigate these stormy waters of depression. "...I ought rather to rejoice rather than otherwise that to you it is given, not only to believe, but also to suffer. If you escaped these things, whereof all the Lord's children are partakers, might you not question your adoption into His family? How could the power of grace be manifest, either to you, in you, or by you, without afflictions? How could the corrupotions and devastations of the heart be checked without a cross? How could you acquire a tenderness and skill in speaking to them that are weary without a taste of such trials as they also meet with? You could only be a hearsay witness to the truth, power and sweetness of the precious promises, unless you have been in such a situation as to need them and to find their suitableness and sufficiency." Powerful truths from a man whose words still speak loud and clear...today! Yes, God allows us to go through deep waters not only to stretch us and cause us to trust Him implicitly but brings us out on the other side so we can encourage others and say honestly..."I know what you're going through. I've been there myself." Here's some encouragement penned from Charles Spurgeon - " However difficult and painful thy road, it is marked by the footsteps of thy Savior; and even when thou reachest the dark valley of the shadow of death, and the deep waters of the swelling Jordan, thou wilt find His footprints there. In all places whithersoever we go, He has been our forerunner; each burden we have to carry, has once been laid on the shoulders of Immanuel." I love that last thought - each burden we have to carry, has once been laid on the shoulders of Immanuel. Isn't that huge?? Each burden David! Each one! It has been carried by Jesus!